You’ve learned the basics of keyboard playing, so now it’s time to explore new styles and techniques to help you become a well-rounded and more knowledgeable player. 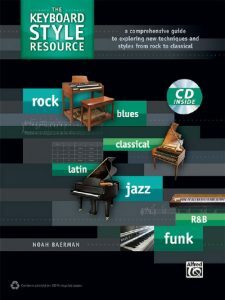 With The Keyboard Style Resource, you will be exposed to a variety of musical influences that will help you create a unique, original, and exciting sound. You’ll learn how to use scales, chords, rhythms, and arpeggios, and how to solo in many different styles. Dig in and explore new concepts that will unleash your inner musical potential. The included CD clearly demonstrates the musical examples in the book.